Placing poppies in the Godley Plot was an annual ritual – one for Ray and one for Gerald’s brother Ben, who had a short life due to injuries sustained in WWI. Assuming this was a Christchurch tradition, I expected to find something about it online, perhaps some photographs of poppies around the statue, but there is no mention of it (it’s odd, isn’t it, how we both distrust what we read online, and doubt the validity of what isn’t there). I’d love to hear from anyone who remembers their family placing poppies in the plot. I hope my grandparents knew that we would carry on the remembering – I think they did. What they probably couldn’t have imagined was a world where we could lay a poppy at a distance, via the internet. 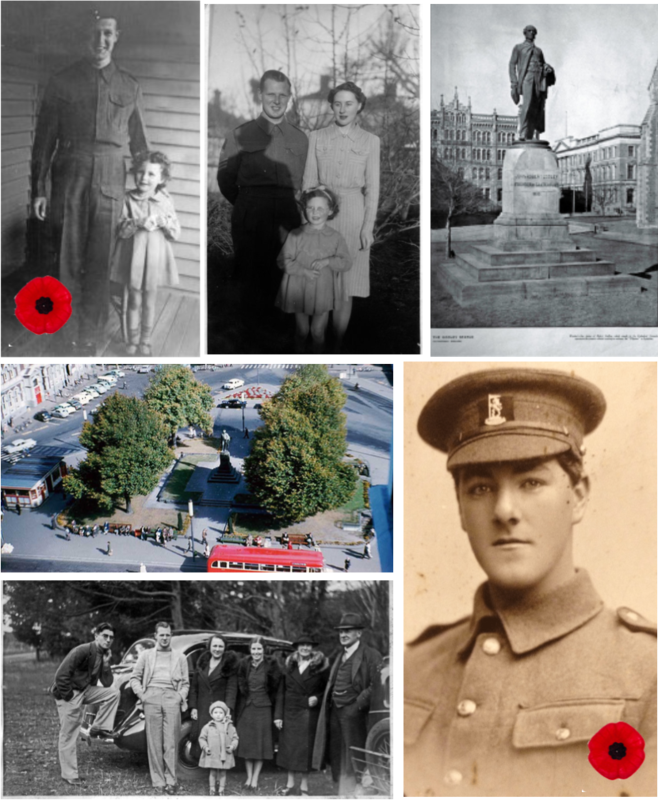 I have found both Ray and Ben’s war records on the Auckland War Memorial’s online cenotaph, and the process of adding a poppy feels more substantial, and more moving, than I would have thought. Photographs of the Godley Statue found on the Christchurch libraries site.